Material Components (MDC) helps developers execute Material Design. Developed by a core team of engineers and UX designers at Google, MDC includes the same visual components Google uses in over 80 Apple AppStore apps. 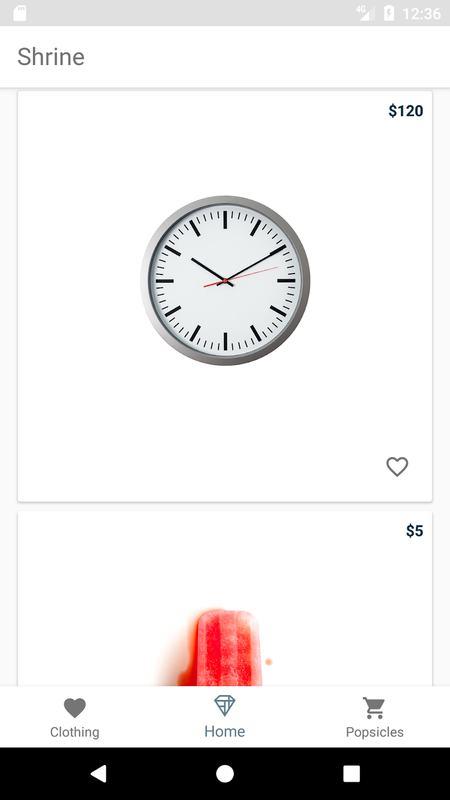 MDC has over 10 beautiful and functional Android components and is available also for iOS and Web. This codelab will show you some situations where MDC can make your app more functional and more beautiful while saving you engineering time. 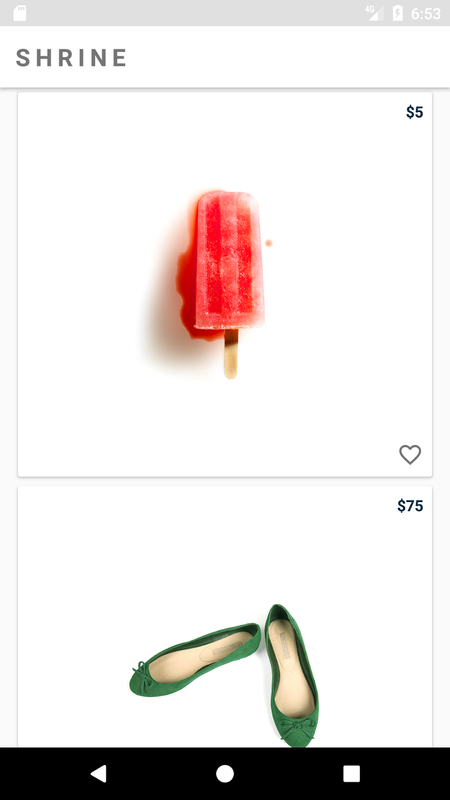 Have an animated, stretchable app bar. This codelab is focused on using Material Components. There are mentions of non-relevant concepts and code blocks for you to simply copy and paste. The starter app is located within the /starter directory. To keep things simple, be sure not to import the top-level directory (mdc-android-kotlin). 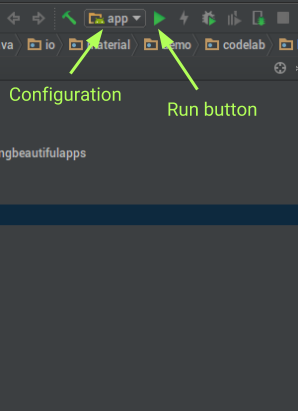 Make sure the configuration to the left of the Run / Play button is ‘app'. Press the Run / Play button. 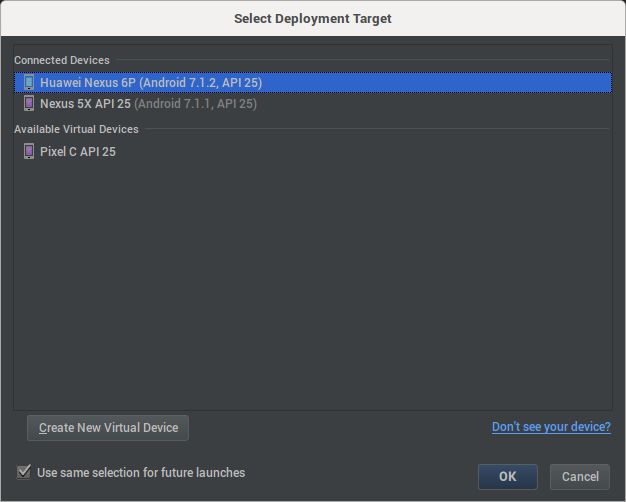 Select a device in the deployment target dialog. Voila! 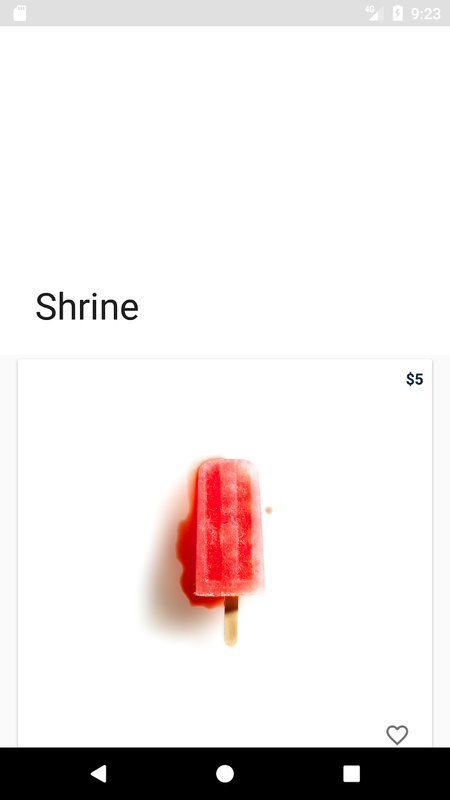 Shrine is running on your device or emulator. 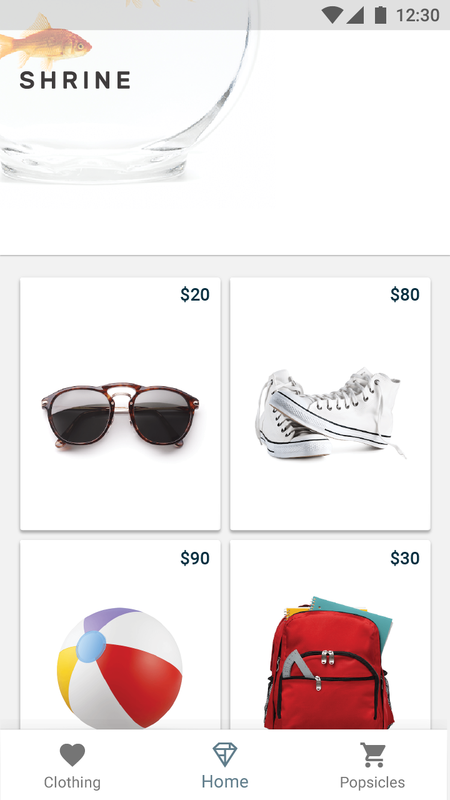 Scroll through the list of products on the app and click on them. But the app is clearly not finished yet. What's a Collapsing App Bar? 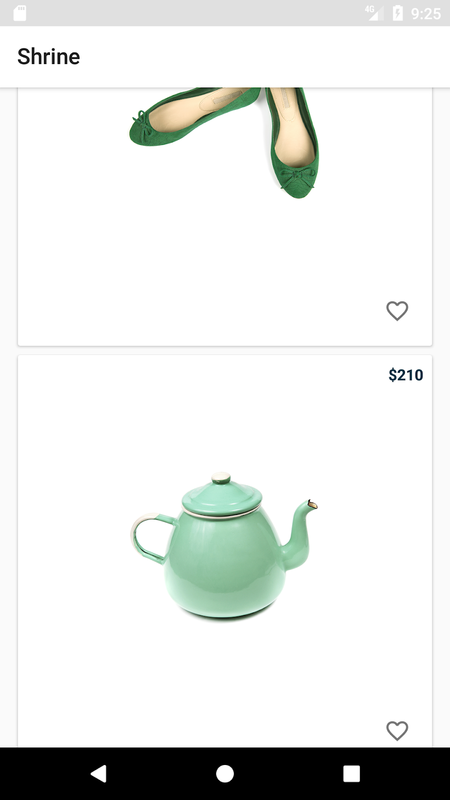 Let's say the designer gave you the following mocks and you're going to update the app to match. 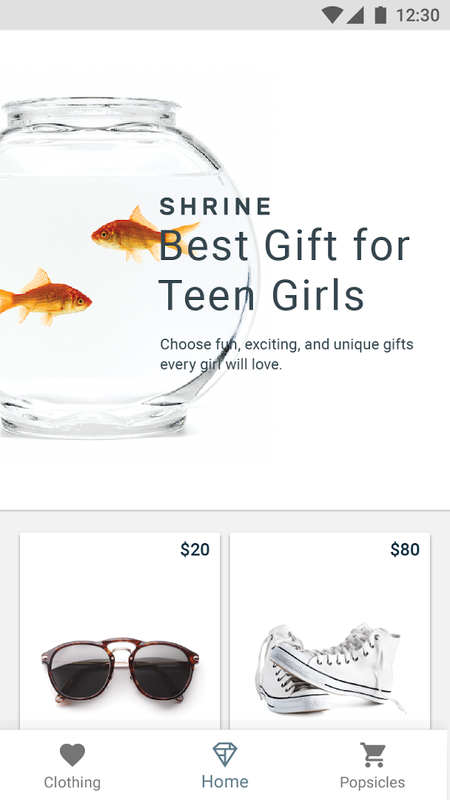 Making a static layout that looks like the mock on the left can be done with simple layout classes built into the Android framework, and the mock on the right can be done with the Toolbar class, but how do you transition between those two states and handle the gestural input properly? AppBarLayout, together with CollapsingToolbarLayout and CoordinatorLayout, can do that: CoordinatorLayout notifies its children of scroll events and changing positions, AppBarLayout provides configurable behavior based on scroll position, and CollapsingToolbarLayout allows you to configure how views move between an expanded and collapsed size. When it gets to a minimum height, say 56dp, it freezes in place and allows the scrolling View (such as a NestedScrollView or RecyclerView) to scroll beneath it! It even adds a shadow. After editing the file, make sure to sync the project to these changes so that all the necessary libraries can be installed. 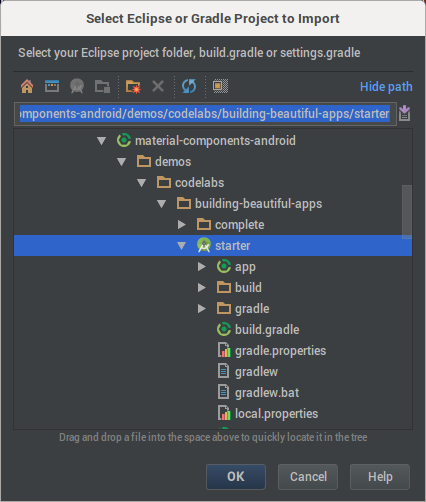 This can be done by choosing "Sync Project with Gradle Files" from the Tools -> Android menu. CoordinatorLayout acts like a FrameLayout, but allows its children to react to changes in dependent views, such as scrolling or other movement. To take advantage of these features, use a CoordinatorLayout as the top-level container. Make sure that you include the xmlns:app attribute when making this replacement, as we'll need the app namespace to use attributes from these widgets. As the main content moves, AppBarLayout and CollapsingToolbarLayout will work with the scrolling RecyclerView to adjust toolbar content. The AppBarLayout's height determines the height of the app bar in its expanded state. The Toolbar's height determines the height of the app bar in its collapsed state. In this case, this means that our app bar will collapse from 400dp to actionBarSize (56dp on smaller devices like phones, 64dp on larger devices like tablets). The layout_scrollFlags tell the AppBarLayout how that child should behave during scrolling. In this case, layout_scrollFlags specifies that scrolling events will be consumed by this View until the CollapsingToolbarLayout reaches its minimum height, and that it should snap to be fully expanded or fully collapsed once scrolling stops (and never be stuck in a middle state). One last thing: tell CoordinatorLayout that the RecyclerView's scroll events should notify AppBarLayout. CoordinatorLayout Behaviors can respond to a number of different user interactions, including scrolls and flings (very fast scrolling). We need a Behavior implementation that intercepts scrolling events and forwards them to our AppBarLayout for handling, so that it can potentially use them to expand or collapse our app bar. Fortunately, there is a Behavior implementation written just for this purpose: appbar_scrolling_view_behavior. Add this Behavior implementation to the RecyclerView in MainActivity's layout file and remove the top margin. CoordinatorLayout will handle the vertical offset automatically. Remove the v21-specific styles for the Toolbar. CollapsingToolbarLayout will handle adding the necessary elevation as the toolbar is collapsed. Delete the Widget.Shrine.Toolbar style from the values-v21/styles.xml file. 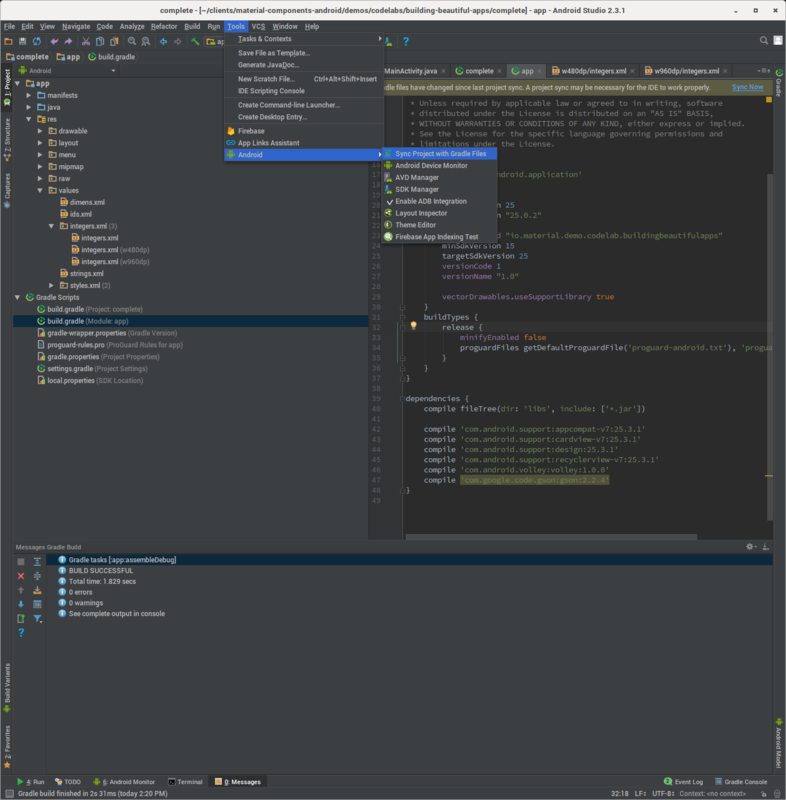 Note that in Android Studio, all the styles.xml files will be grouped under a single entry. You can expand this entry to select the (v21) version and make this change on it. Now, there is a nice, large landing page header that slides away, condensing into just the logo in the app bar. However, we can make better use of this enlarged content area. 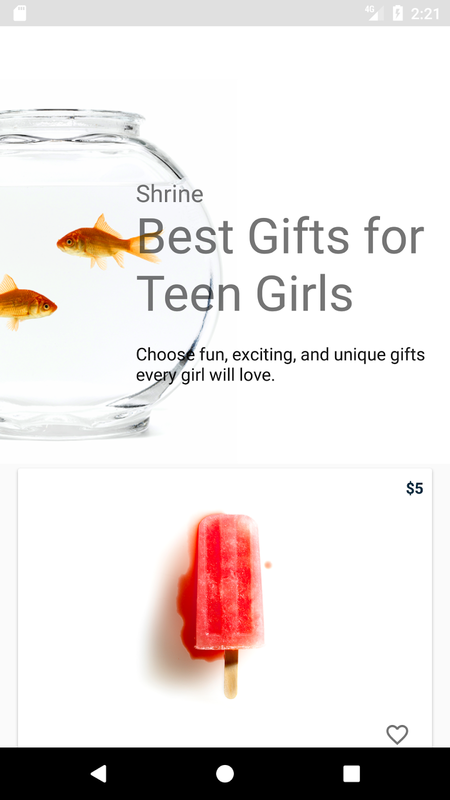 To make good use of this expanded App Bar real estate, include some larger, immersive content that will collapse and fade out as the user scrolls. CollapsingToolbarLayout has built-in support. To use it, add the content as children of the CollapsingToolbarLayout and specify their behavior as layout_* flags. NetworkImageView allows us to load images from a URL, but CollapsingToolbarLayout will work just as well with a stock ImageView class (or any other View type). The important piece is adding the layout_collapseMode and layout_collapseParallaxMultiplier attributes. A layout_collapseMode of parallax tells the CollapsingToolbarLayout that this view will collapse at a slower or faster rate (specified by layout_collapseParallaxMultipler) than its container. The large header is filled with eye-catching content that disappears as the user scrolls up. Apps need a way to navigate between screens. The mocks use the bottom navigation pattern, which is good for apps with a small number of navigation destinations that are all of similar importance and prominence. Material Components provides BottomNavigationView to implement this pattern. It functions much like a menu, and can be configured almost entirely via XML resources. Important: Make sure the item has a name of colorPrimary and not android:colorPrimary. The former is used by the Android support libraries (and Material Components for Android) and supported on all the platforms they support, while the latter is part of the Android framework, and only works on Lollipop (API 21) and above. Theme overlays are a feature of Android that allow you to override specific theme attributes for a View and all of its children, while leaving the rest of the Activity or Application theme intact. This feature is often used for pieces of the UI that have a different color scheme than the rest of the app, such as app bars that have a dark color scheme that are displayed inside a light-themed application. The theme overlay applied to our BottomNavigationView will change the primary color to the accent color from our main theme (replacing the white color with a blue-grey one). Since BottomNavigationView uses the theme's current primary color for tinting the active navigation icon, this has the effect of making the active navigation icon a blue-grey color. Users generally want their navigation buttons to take them somewhere. Attach some listeners to the view and handle those changes. BottomNavigationView provides two listeners for navigation events. OnNavigationItemSelectedListener lets you know when a new navigation item has been selected, so that you can change to the new category. OnNavigationItemReselectedListener lets you know when the currently selected navigation destination was reselected. 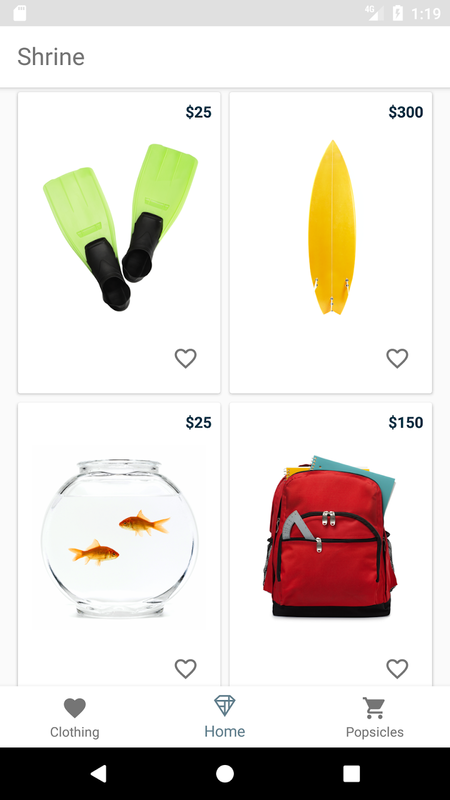 A common way to handle this is to scroll to the top of the current category's items. The bottom navigation is easy to reach on the screen and gives the user a smooth way to move around the app. By tapping on the currently selected navigation icon, the user can quickly scroll back to the top of the content — a great resource when reading long lists. To create the card layout with increased density, move to a GridLayoutManager for the RecyclerView. This card layout also supports large screens. You can select different values based on screen size with Android resources. Use Android resources to pick a different number of cards for smaller and larger screens. If the screen width ever grows larger than 480dp in landscape mode, the grid will display 3 columns instead of 2. This will take care of devices that are much larger than the base size, such as large tablets. GridLayoutManager makes it easy to create a layout with items of constant size. Loading the column count from resources will take care of changing the density of content as screen size changes, such as when the user rotates their device or adjusts the size of an application in multi-window mode. Try the app across rotations or maybe on a larger device or emulator to see how the layout changes. To learn more about collections (lists) in design and app flows, see the Material Design guidelines. 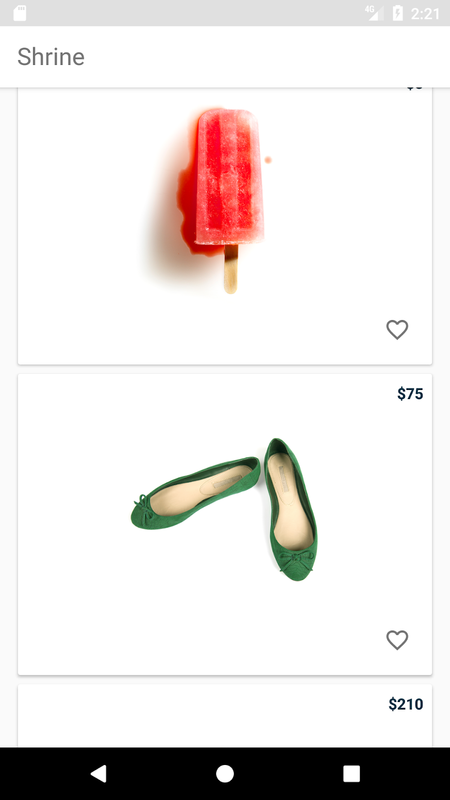 We started with a basic ecommerce application, but gave it new life with Material Components for Android. Now there is a large, immersive app bar with eye-catching content that moves away when the user scrolls down to look at the content. 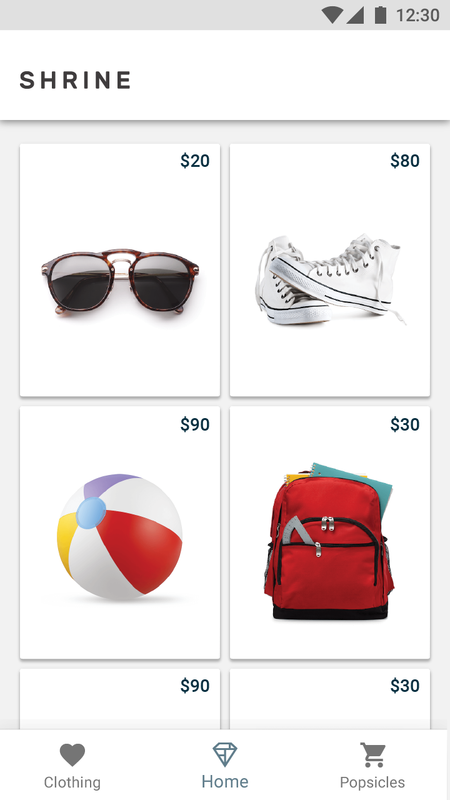 The bottom navigation is easy to reach and makes it simple to navigate around the app. The grid adjusts its content density across various screen sizes. You and your designer can rest easy knowing your app is using components that are well tested and follow the Material Design guidelines. A final version of the app is available within the /completed directory. Feel free to test your version of the app against the completed app in the directory. This simple example demonstrates a few important components, but Material Components for Android has more to offer. 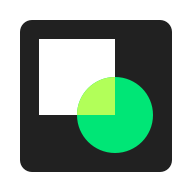 Take a look at the Material Design GitHub repository, which contains all of the code that makes up the library, as well as documentation for the components, and applications that demonstrate a wider variety of components and usage. Thank you for giving Material Components for Android a try, and we hoped you enjoyed this codelab!